Press Maintenance and Inspection | Stamtec, Inc. Improved Production. Increased Press and Tool Life. Better Parts. 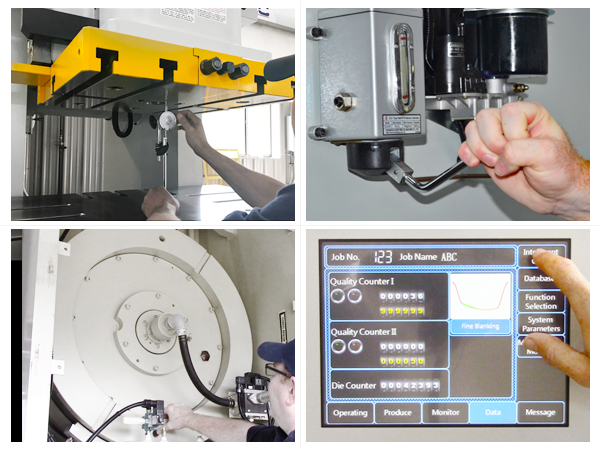 Regular press maintenance and inspections, prior to break-downs will save you from unexpected breakdowns and costs. Stamtec can design a press maintenance and ongoing inspection program on both Stamtec and non-Stamtec presses that will decrease downtime, enhance output, and establish a documented system for maintaining press integrity. Following the press assessment, the Stamtec maintenance and inspection team will recommend modifications, updates and improvements. These recommendations will prioritize the maintenance program work. Preventive maintenance is not a single event, but an ongoing process. Please give Stamtec Press Maintenance and Inspection team a call at 931-393-5050. Save time and money with Stamtec press maintenance and inspections. Contact us for more information on the press maintenance and inspection services your stampng operation needs to succeed.